Friday July 8th 1921 I walked over to Lizzie Duncans to spend the day. The weather was cooler after a shower last night. I met friends calling there. Came back at supper time and spent evening on the porch. Letter from Lizzie Lindley. Saturday July 9th 1921 Busy with my tatting. wrote Birdie in afternoon and slept some. Vene and Edith busy with their work. warm day. Sunday July 10th 1921 A frightful hot day. Read a little in forenoon. Vene not well. I slept in afternoon. Mrs Cobean here late in afternoon and for lunch. The evening on the porch. 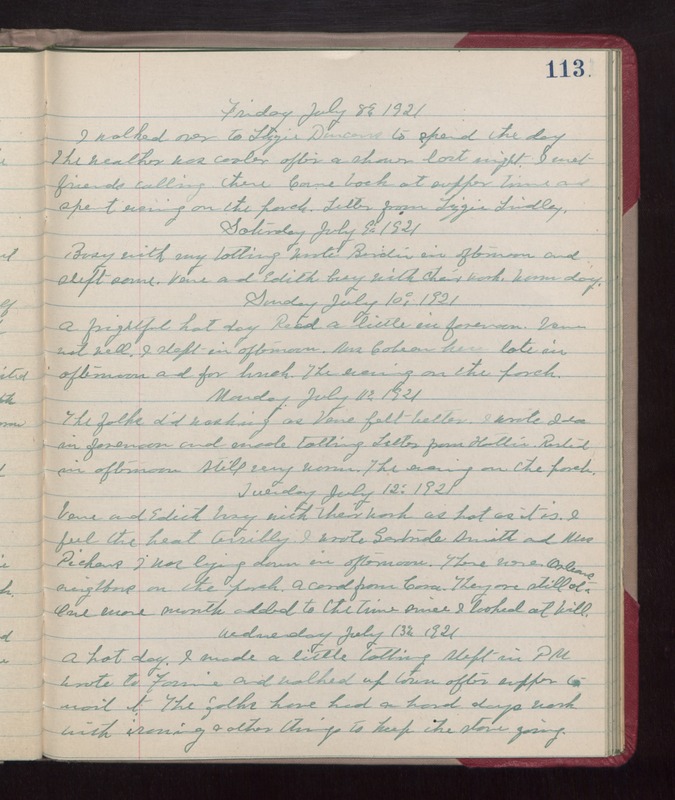 Monday July 11th 1921 The folks did washing as Vene felt better. I wrote Ida in forenoon and made tatting. Letter from Hattie. Rested in afternoon. Still very warm. The evening on the porch. Tuesday July 12th 1921 Vene and Edith busy with their work as hot as it is. I feel the heat terribly. I wrote Gertrude Smith and Miss Pickens. I was lying down in afternoon. There were neighbors on the porch. A card from Cora. They are still at Orleans. One more month added to the time since I looked at Will. Wednesday July 13th 1921 A hot day. I made a little tatting. Slept in PM wrote to Fannie and walked up town after supper to mail it. The folks have had a hard days work with ironing & other things to keep the stove going.